Protests against the Mexican government spread to the United States on Tuesday, as demonstrators took to the streets outside the White House. Inside, US President Barack Obama met with his Mexican counterpart, Enrique Peña Nieto. Dozens of protesters from across the US braved a snowstorm to make their voices heard. They demanded justice for the so-called ‘Missing 43,' a group of 43 students who disappeared near Iguala, in the southern Mexican state of Guerrero, on September 27 following a protest to support the rights of rural teachers. An independent investigative report published in December claimed that the Federal Police was directly involved in the attack, contrary to the authorities’ statements. It also asserted that state and federal authorities were tracking the students’ movements on September 26 in real-time; not only did authorities do nothing to prevent their abduction and consequent murder, but police reportedly directly attacked the youths. Local Mexican authorities revealed that the 43 students were handed over to the Guerros Unidos gang, which confessed to murdering them and reducing their bodies to ashes in September. Their disappearance has posed the biggest challenge so far to President Enrique Pena Nieto's administration, with many questioning the government’s progress in fighting against drug violence. 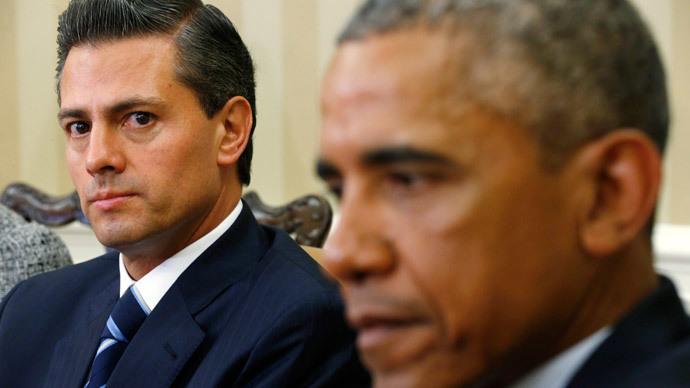 Obama and Peña Nieto discussed the missing students during their meeting. The Mexican president has drawn criticism for saying it was time to “move beyond” the case just weeks after their abduction and for taking a month after their disappearance to meet with their families, AP reported. Maria de los Angeles Pineda Villa, whose husband José Luis Abarca Velázquez was the mayor of Iguala when the students went missing, has been charged with organized crime and money laundering. Pineda is being held in a maximum security prison until the start of her trial, Al Jazeera reported. Prosecutors have said members of the drug gang linked to Pineda confessed that Abarca had ordered the police to crack down on the students to stop disrupting an event she was speaking at. The former mayor was charged in November with organized crime, kidnapping, and homicide for events previous to the students' disappearance.